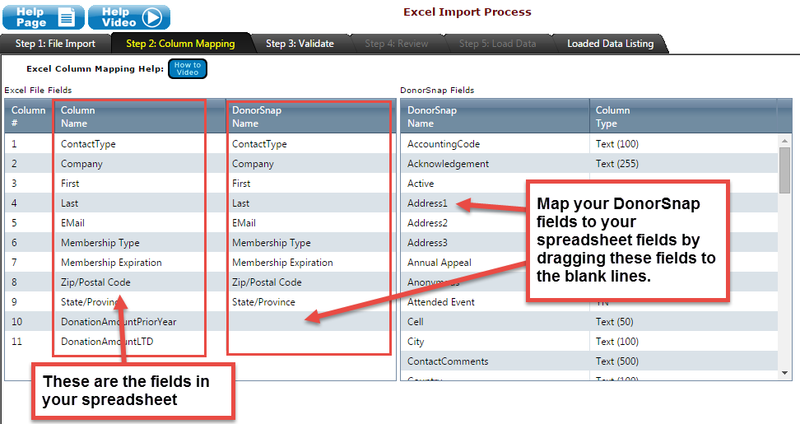 Excel Import -- Are you getting the most out of DonorSnap? Continuing on from the last newsletter, we'll walk through another data entry tool: Excel Import. This more advanced tool is extremely versatile. If you're an Excel pro, this will be your go to tool. If you hate Excel, you don't have to fret, it can still be used for some easier tasks such as changing existing contact information in your database. Add new activity records (donations, notes, interactions, etc.) to existing contacts. Before any donations or other activity records can be added to your database, the contact must first be created in your database. Let's start with an easy one. Perhaps you just had an event where you met a lot of new people, and none of them made a donation. Their contact information was recorded in a spreadsheet at the check in desk and now you want to load them into DonorSnap so that you can track them in the future. All you need to do is format the data into columns with headings just like the field names in a DonorSnap record. The first name should be in one column, the last in another, and so on. If you need a cheat sheet, just open up a contact record and look at the fields you use to track your data. Don't forget to include the other fields you use such as Contact Type, Attributes, etc. Once your spreadsheet is formatted correctly, upload it to DonorSnap and link the column titles from your spreadsheet to the field names in DonorSnap. You'll be able to review the data before you load it to make sure that everything looks the way you are expecting. If you make a mistake, don't worry. You can reverse an import with just the click of a button. 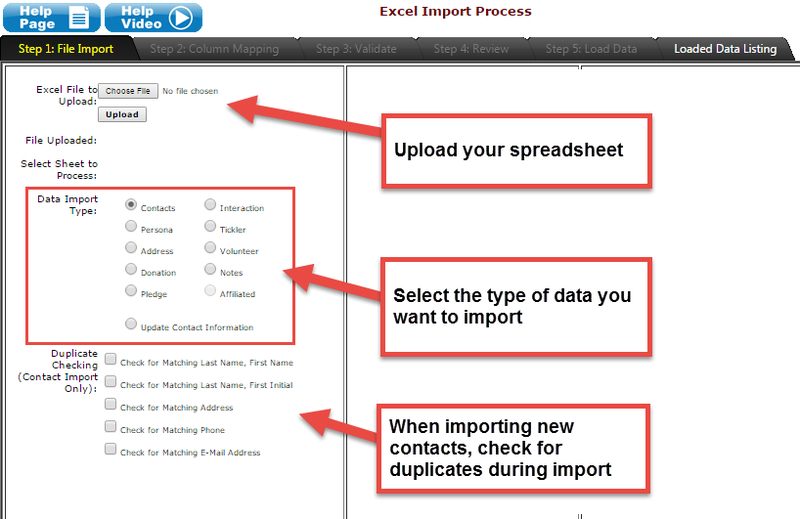 Steps 3-5 is where you can review the actual data and make sure that you are importing what you are expecting to import. Any errors in the data will be shown and you will have the opportunity to export those error records to Excel to fix and upload separately from your original spreadsheet. If you make a mistake in an import, you can undo an import on the Loaded Data Listing tab. If you're looking to do more advanced imports such as importing donations, there are a few extra steps that you'll need to complete. The most important step is to make sure that you have a unique field in your spreadsheet that exactly matches one and only one contact in DonorSnap. The best way to do this is to use the ContactIPK field, which is just the unique ID number that DonorSnap assigns to each contact when it is created. If you are importing a spreadsheet that has a list of new contacts and a donation for each of them, you'll want to create an ImportKey field first to make it easy. Since this type of import is much more advanced, it will be easier to understand by watching the training webinar recording. In this training, you'll learn specifically how the tool works and how to format your spreadsheet in the required way. Watch the Excel Import training webinar. The final way to use Excel Import is to update any of the data in the contact tab for existing records. This is an easy way to make mass changes to your database for new tracking initiatives, correcting mistakes, and data cleanup. It's as simple as exporting the data you want to change from DataMiner Platinum along with the contact's ID number (ContactIPK). If you are creating new fields to make changes to, make sure to create them first and include them in the DataMiner Platinum export. Once you have the data you want to change in a spreadsheet, leave the column names in place and change any of the data that you need to. The ContactIPK number will allow you to import the spreadsheet back into DonorSnap and match the changes to the correct contact. It's important to remember that every change you make in your spreadsheet will overwrite what is currently in that field in DonorSnap. If there is a column that you are not making changes to, it is best to remove that field from your spreadsheet before you upload it back into DonorSnap to avoid any accidental changes. If you delete the value in a cell and import it, a blank value will replace what is currently in DonorSnap. Watch the training video to see step by step how to update existing contacts in DonorSnap.